TALKING AGRICULTURE: Vice President Pence offered his insight during a keynote address for National Ag Day. National Ag Day, an event that was sparked 45 years ago by the Ag Council of America, has grown in importance as groups around the country highlight the work of farmers in local communities. For 2018, the ACA had a few dignitaries on hand for National Ag Day including Vice President Mike Pence and Secretary of Agriculture Sonny Perdue. During a keynote address from the Whitten Building Patio at USDA, Pence offered his take on the work of the Trump Administration to promote trade. "President Trump is working with USDA to renegotiate trade agreements to reach new and better deals for the business," Pence said. "We've expanded rice exports to Colombia, and made a deal for the first time in a decade to send beef to China. And we've expanded trade of distillers dried grains to Viet Nam. And we're just getting started." Pence also pointed to the Trump Administration's commitments to infrastructure investment, which will benefit farmers with road and bridge improvements. Pence also shared the importance of the administration's push for broadband internet access, noting that this investment will help farmers maximize their use of technology. Pence promoted the idea that agriculture offers new job opportunities that many people are not thinking of. Pointing to FFA and 4-H members at this Ag Day celebration, he shared that they should consider careers in ag because "we need more like you." 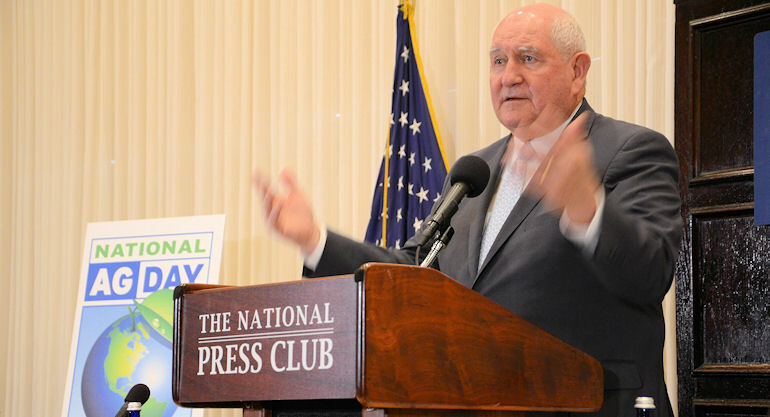 During a special Ag Day event at the National Press Club, Secretary of Agriculture Sonny Perdue talked about work being done on the Omnibus Funding bill that Congress is reviewing to keep the government working. One area that will be addressed in that measure is the 199A provision from the new tax bill that turned out to have consequences beyond originally intended. In fact, the current version would allow nearly everyone to create a cooperative to take advantage of the program, including journalists. "Imagine that, a cooperative for journalists," Perdue joked. Perdue noted a few areas of focus for USDA including trade issues, the farm bill, the renewable fuel standard, rural infrastructure, and rural broadband investment. He remarked on the value of trade for agriculture, and said he reminded President Trump regularly that U.S. Agriculture has a $100 billion surplus that helps offset other trade issues, he said. Fair trade is important to the Trump administration and Perdue is working to make sure the trade policy from the White House benefits farmers. Perdue repeated a story he told recently at the Commodity Classic, where an inadvertent coughing fit was well-timed in a meeting with President Trump where talk of pulling out of NAFTA came up. "The President asked if I was okay and I told him I get choked up whenever he mentions pulling out of NAFTA," Perdue said. But new tariffs on steel and aluminum are a concern for the Ag Secretary. "Agriculture could be the tip of the spear in a trade war," he noted. "We'll do best on aluminum and steel tariffs to invite countries in to talk about why they should be excluded from the tariff." As for the Renewable Fuel Standard, Perdue said that talk of high-priced Renewable Identification Numbers could be changing. He shared that when talk of RIN changes first appeared the price per RIN was 98 cents and that has since fallen to 38 cents. That could change the conversation on this renewable fuel issue, which remains a key topic for the Trump Administration. A wide-ranging panel also engaged in a conversation of sustainability with Farm Broadcaster Max Armstrong as the moderator. The panel included John Teeple, director of advanced technology John Deere; Mark Ulness, John Deere Outstanding Young Farmer; Emily Buck, associate professor Ohio State University, and a U.S. Farmer and Rancher Alliance Faces of Farming and Ranching; Zippy Duvall, president, American Farm Bureau Federation; and Sarah Hendren, nutrition and quality assurance manager, Culver Franchising Systems LLC. SUSTAINABILITY FOCUS: A farm panel of experts addressed the concept of sustainability and what that concept means for the 21st Century Farmer. The panel engaged in a range of issues surrounding sustainability including the idea that producers should continue telling their story of the work they do on the topic. Ulness, a Wisconsin dairy farmer, noted that on his farm he has to concentrate on injecting the manure their cattle produce, to make sure those nutrients stay where they'll work and be available to his crop, he said. As for sustainability, there are many ways to measure the idea. John Deere has worked to reduce plant waste by 75%, according to Teeple. And work continues to make the other 25% recyclable or recoverable. Panelists noted that sustainability must still meet muster of providing a return on investment; including practices that may be required by a trading partner. For farmers that means knowing costs of producing crops and livestock to better understand value-added pricing and capturing more revenue from buyers who see upstream value. Culver's Hendron said that the company works with suppliers to find just the right product, such as antibiotic free chicken; and then work to provide value to the supplying farmer-customer. All panelists lamented the lack of consumer knowledge, but also noted the communication opportunity to bring these key crop and livestock facts to the end user. The key message is that consumers don't know the intense work local producers did to bring these products to market. And that's something that should change. National Ag Day is a celebration of this business where farmers excel. Dignitaries shared their love of agriculture and all noted that science, technology, engineering and math focus - or STEM - as an education area is critical. In his closing comments, Mark Ulness said that it was consumer pressure, not biotech issues, that took away tech including BST or bovine somatotropin for his cows. He noted that the move by milk buyers to get away from BST led to higher costs to produce the same amount of milk The key being that the move was not science based. "If you look at the BST-free label, there is an asterisk," Ulness said. "It points to a note explaining that there is no scientific difference between milk that's BST free, or produced using BST." Culver's Hendron shared the rising value of social media to help farmers tell their story to non-farm audiences. "Farmers have high credibility," she said, noting that leveraging that stature with consumers will have value in the future. Educating the consumer is important. Duvall pointed to Sanderson Farms and its "honest communication" approach to consumers noting that chickens would be raised without antibiotics, but if one got sick it would be removed from the flock to be treated. "The company is explaining the value of anitibiotics in treating chickens," Duvall said. National Ag Day is a time to reflect on agriculture, but also to look forward. There are several issues ahead, but panelists see opportunity in connecting with consumers and sharing thoughts and ideas of producers to better tell the story of agriculture. It's a challenge that remains for the industry.